Spynosaur (2016. 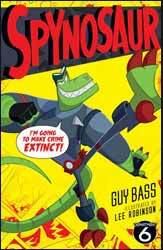 191 pages) is the start of a new comedy series, written by children’s author, Guy Bass and illustrated by Lee Robinson. The book follows the adventures of a spy who has had his brain transported into a dinosaur, which creates the book's central joke, that of an enormous creature in a job which requires stealth and camouflage. Spynosaur has a sidekick in the form of his daughter, Amber, who is excited to be a spy and in equal measure is both proud and exceedingly embarrassed by her father. In this tale Spynosaur and Amber are on the trail of the notorious villain, Ergo Ego and his latest weapon of mass destruction, the McGuffin. Along the way we also meet Amber’s mum, who doesn’t know that Amber is a spy - because she has a double that stands in for her - and Danger Monkey, another agent with a penchant for throwing poo. The book is heavily illustrated throughout which creates a book which is part prose and part comic, it even has some full on comic book sequences. This compliments the story which is told in a combination of straight prose, heavily peppered with Batman type ‘BANGs’ and ‘POWs’ and the odd comedic poems. There is a little something different on most pages. The book would suit ages nine to ten.